Dry and light, very fruity beers, sometimes tart. Delicious with pastries and druit desserts or as an apertif. Also ideal for dishes with cream or butter sauces. One of the world's most popular styles of beer. Smooth, golden beers with a slightly tangy, light flavor and a clean taste. Goes well with fish and strong dishes like curry. Lighter-bodied beers. Moderate tang, sometimes caramel or toasted with a spicy aroma. Great with a wide range of food such as soups, salads, pizza or a burger. Crisp, lighter beers with mild flavors. American wheat beers have a distinct, citrus character. Delicious with foods such as salads, sushi or vegetable dishes. Smooth and more full-bodied beers with distinctive nutty or woody flavors. 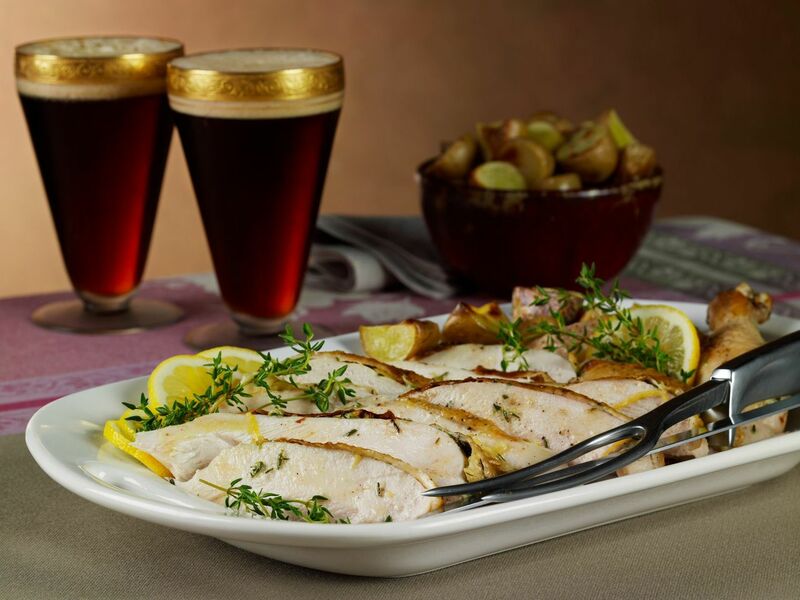 Goes well with hearty foods such as roast pork, grilled chicken or smoked sauage. Strong, heavy beers either sweet or dry, characterized by caramel, toffee, and toasted malt flavors. Delicious with game, lamb, heavy sauage or creamy desserts. Dark ale beers with rich, slightly bitter sometimes sharp taste. Goes well with roasted or smoked food or strong cheeses. Drier, intense ales with a coffee-like finish. The roasted coffee and chocolate notes in these beers provide a rich complement to shellfish, meat dishes or chocolate desserts. There are thousands of labels of beer available across the U.S., so there is a wide variety of flavors, textures and styles - something for everyone and for every palate. Beer enhaves the flavor of food, but food also enhances the flavor of the beer. There is no better way to learn to appreciate the complexity of hidden flavor within various beers than to pair it with food. Start by considering the flavor of the beer: Take a slow slip of the beer and try to determine the prominent flavors. Is the beer yeasty or hoppy? Sweet or dry? Does it have a tangy, sharp taste with a clean finish? Think about how the beer would best relate to foods, keeping in mind that there should be a balance between the two. The beer should either complement or contrast the food. If you're planning a beer dinner with a different beer for each course, plan to serve lighter beers first and progress through the dinner to the heavier, stronger beers. Serve small portions of beer- about four ounces per course - to ensure that guests of legal drinking age enjoy each paired course responsibly. Still not sure which style of beer to use? Take NBWA’s Beer Pairing Tips with you as you shop!